3.Initiate a recharge of 25 or more. 5.Pay the amount with DC/CC. 1.Offer Valid till 25th Oct'15. 2.Offer valid once per new user. 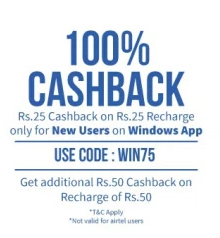 3.Offer valid on freecharge windows app only. 4.Offer valid on transaction with DC/CC.